Croton is a beautiful tropical filler that looks great in a vase for a fresh table decoration. It also works well as a filler in flower arrangements. 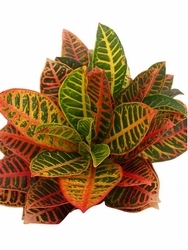 Croton is a very bright, multi-colored leaf, with shades of green, pink, orange, and yellow. Each leaf is between 8"-10" in length. In water this item will stay fresh for 2-4 weeks. *This item is sold as a bunch with 10 leaves.